The body colouring of this species is dominated by a mosaic of large and small golden patches, each outlined in orange, and the body itself is smooth to the touch. The gills and paired rhinophore organs are covered in tiny brown speckles. A few large, raised tubercles, each with an orange coloured tip occur on the back. Adult specimens range in size from 40-60mm. 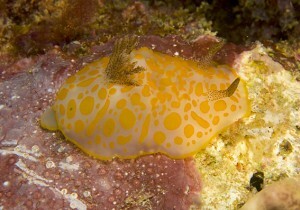 The Gold-spotted Nudibranch is seen from the intertidal zone down to 30m, most commonly on coral reefs. This is a sponge-feeder and lays a yellow spiral egg-ribbon.